The Silent Sam Confederate monument would move to a newly constructed UNC history center on campus, according to a recommendation by the UNC-Chapel Hill Board of Trustees released Monday. 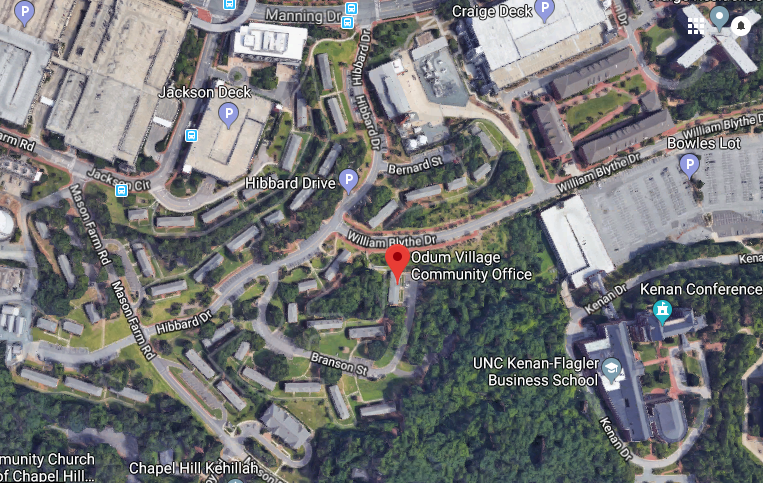 The new center would cost about $5.3 million and be located in the Odum Village area, which is in a more remote but growing part of the Chapel Hill campus. Folt and UNC General Counsel Mark Merritt both said they believe that will satisfy the law’s requirement that any such “object of remembrance” that is moved be put in a similar place of prominence. A satellite image of the Odum Village area of campus, where a newly proposed UNC history center would house the Silent Sam Confederate monument. “Many people who come onto the campus don’t walk,” Folt said. The proposed center’s accessibility to those entering by car – and perhaps, in the future, light rail – would make it a prominent place in an area of the campus that will only become more prominent under expansion plans. The statue was toppled by protesters back in August. Security concerns made returning it to its historic place at McCorkle Square impossible, Folt said. Security consultants also recommended against moving it to any outdoor place or a number of possible existing indoor locations. The proposed center would include a classroom area and space for traveling exhibits that will put the Confederate monument into historical context and tell a more complete history of the university, Folt said. The plan will have to be approved by the UNC Board of Governors, who will meet next week. State lawmakers may also get involved if they are not satisfied with the solution. “We just got it just like you did,” Byers said. “We’re going to look at it and consider it and try to do the best thing for the people of North Carolina. Two UNC Board of Trustee members voted against the recommendation – Allie Ray McMullen and Savannah Putnam. Putnam, who serves as UNC-Chapel Hill Student Body President, said she could not support returning a Confederate monument to a campus at which it no longer has any place. A protest against the recommendation by students and community members was announced within minutes of its approval.